With everything else going wireless these days, it was only a matter of time before USB–the de-facto standard these days for connecting peripherals–would follow suit. At Pepcom’s Holiday Experience press event in New York yesterday night, some of the companies behind this effort were on hand to show off their wares. One of these companies was Imation, who was showing off the Apollo Pro WX, the first external hard drive to be certified under the standard. 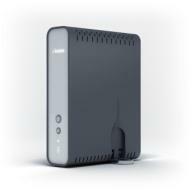 Available in capacities from 250GB to 1.5TB, it is part of a larger rollout of external harddrives from the company aimed at the higher end of the market. Wireless USB promises transfer rates of 480MBps when the devices are within 10 feet of each other, and 110MBps within 30 feet. At the closer ranges, this is about as fast as most current wired external HDDs, although of course this is theoretical. I can’t confirm how accurate these transfer rates are, but it appears to be pretty fast. In any case, this would be attractive to those of us who are annoyed by the amount of cables that may be cluttering up our desks. Expected availability is in the fourth quarter of this year, however no specifics on pricing for the devices have been given. It would be compatible with both Windows and Mac OS X platforms. It would also ship with backup software, which Imation appears to want to target the line toward that segment. The Pro WX was not the only device shown off Thursday night. WiQuest, the company that is behind the chips which enable Wireless USB, also showed off a wireless hubs for traditional USB by both Kensington and D-Link, and Wireless USB-enabled laptops from Dell. Dell would be including the technology in select Latitude and XPS models, WiQuest says. If you’re curious about what Wireless USB is and would like some more technical details of the specification, check out this Wikipedia entry. This is probably completely off, but can some brilliant electrical engineer explain why we can’t then power devices over the air? Like charging your iPod over USB?